With this flock sheet you just rub the design onto your card or scrapbook pages to add cute accents. Cut around the design you want to add to your cardstock and then place it with the white sticky picture face down on the paper. Rub the back of entire piece and slowly lift off the paper rubbing some more if it needs it. When you peel it away the blue velvety image is face up on the cardstock. It is so cute and easy to use. Also available in pink. 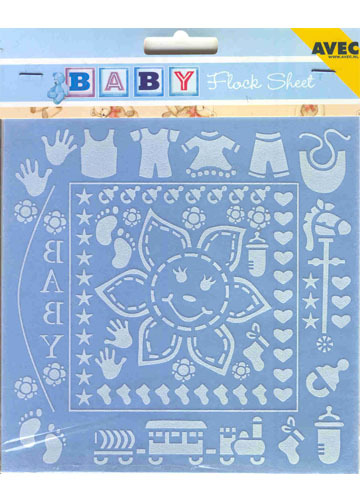 Coordinates with stencil # 4610031 and cutting sheets pack #Baby3D. Look for idea booklet #4406180 for instructions and inspiration with this product. Size of the entire sheet is 6" x 5 6/8".